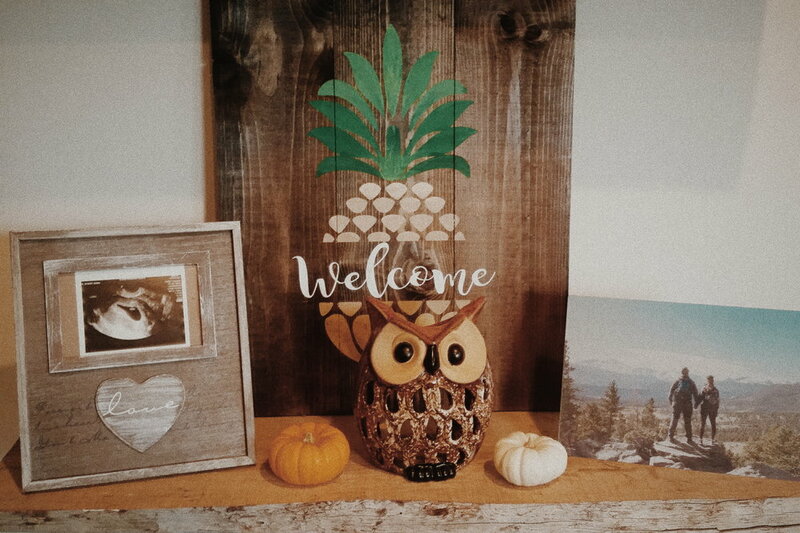 This shelf in our house is representing so much change, actually: the “welcoming” of a new season, figuratively and literally; the step into a new chapter of life (my friend Chelsea left me the owl as she was embracing on a new beginning away from San Diego); Rickey and I beginning a new season of our lives together - and the shift towards becoming parents. As you can see: It’s all related to time - and taking things slower, being in the moment with your thoughts. For once. When I went to yoga the other day, our instructor was talking about how fall is not just “everything pumpkin”. Rather, in a more spiritual or symbolic way, if you will, it is a season of cleansing an cleaning things out. Both physically and emotionally. I had to think about it for a second but it made total sense. The falling leaves that are associated with fall - there’s something beautiful about this cleansing of the soul, mind, and body. It eventually, after a time of peace and calm, gives space for something “blooming new”. And that is how I feel about fall. I just love that it gets darker earlier. The days are getting shorter and crisper (even here in SoCal). This allows for conscious, mindful moments. I light candles. Make tea. Put on a soothing fall playlist that gives me all the warm, fuzzy feelings and allows me to just sit back and be in my own headspace. I have an opportunity to reconnect with myself. But we need to actively take this time to ourselves. You close one chapter and begin another. That’s what fall is emphasizing. My yoga instructor also mentioned that now be a good time to give something up; to declutter our minds, rethink relationships, and, generally, give up things (and, sometimes this also means people) that no longer serve us in this new season of life. We all change. Evolve. Begin new chapters at different times. And sometimes, we go together, sometimes, our ways part. I am having real trouble with this one, but being honest with myself, I realize that it might just be a natural process. But, this also means new souls step into your life. It’s an infinite circle and always will be. Fall is an opportunity to close one chapter and start a whole new one. For Rickey and I, this means: preparation for our oh so much loved soon-to-be-born baby boy. We are a few weeks shy of beginning this new rollercoaster of a chapter as new parents. And even though I cannot wrap my head around it just yet, it does feel real now, because we have officially created this bubble around ourselves that we now live in. It’s an amazingly beautiful one, though. Now is a great time to just go on that drive you wanted to embark on; go on that road trip; find a little hideaway spot; plan a little getaway. The latter is what Rickey and I will be doing tomorrow for a few days. Let’s call it a quick “babymoon” . We will be heading up to Big Bear where we have rented a little cabin. All we will be doing is being outside, walking (or waddling, for that matter), enjoying nature, reminiscing about where we started, what we have been through and where we are now - and what’s lying ahead of us. Napping, eating, cuddling, being cozy. And, most importantly: unplugging. Phone will be aside for most, if not all, of the next few days. I encourage you to do the same. Maybe also give up something, no matter how minor, that no longer serves you? Whatever it may be. Embrace the season in a more mindful way and think about what it can do in your life. I’ll be sure to, once we’re back, share some fall-sy, outdoors-y impressions from our mountain trip to Big Bear with you. For our German-American couple life, follow @bell_ventures. Sign up for the wanderlust list below, going out this Sunday (a round up once a month incl. exclusive content and behind the scenes! ).